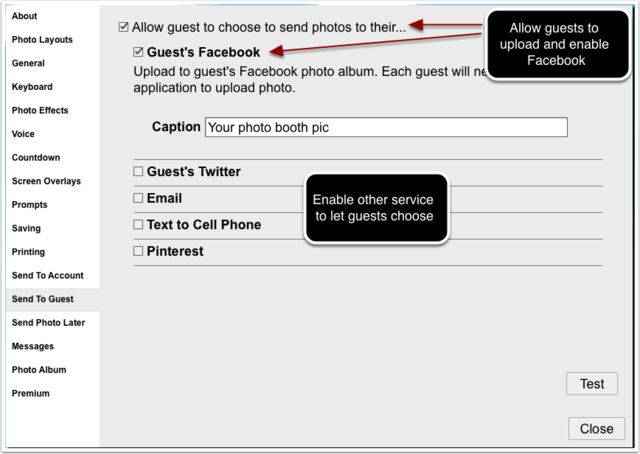 If you want to upload photos to your guests' Facebook account, go to Settings > Send to Guest > enable Guest Facebook. After photos are taken, guests will be prompted to sign into their Facebook account and the photo will be posted to their photo album. To allow uploads of the same photo to multiple guests' Facebook accounts, go to Settings > Prompts > check Upload photo to another account. 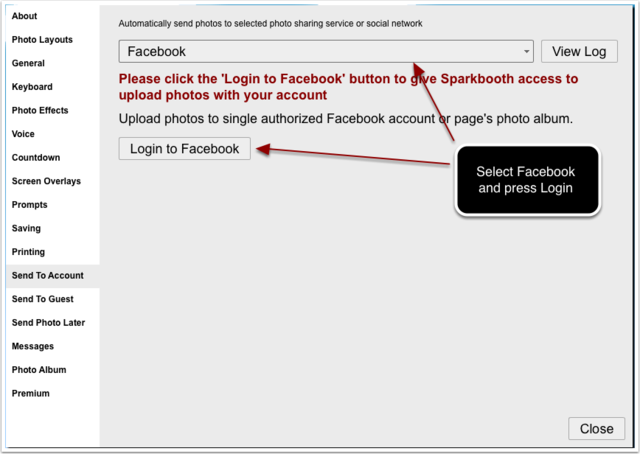 After a photo is uploaded, Sparkbooth will prompt guests if they want to upload into another account. If you want to prompt guests to upload photos to your guests' Facebook, Twitter, or email account, go to Settings > Send to Guest > enable the uploading options that you want. After photos are taken, guests will be prompted to select Facebook, Twitter, or Email as upload options. You can configure which options to display. To allow multiple uploads of the same photo to different guests' accounts, go to Settings > Prompts > check Upload photo to another account. 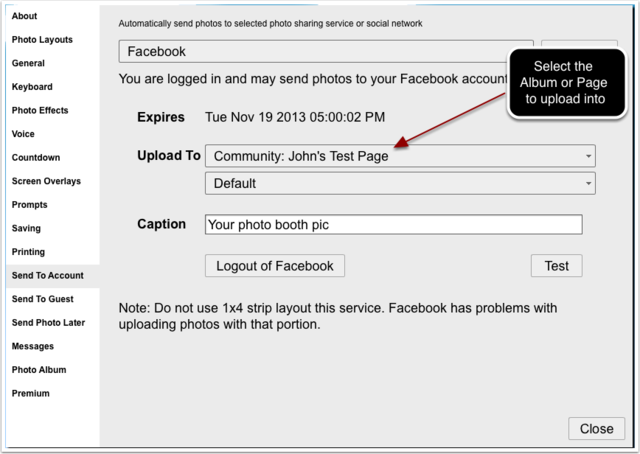 After a photo is uploaded, Sparkbooth will prompt guests if they want to upload into another account. If you want to upload photos to your account or a Facebook page, go to Settings > Send to Account > select Facebook and sign into your account. After signing into your Facebook account, you can select the any photo album in your account or Pages you administer to send photos.